The Wabbit tried very hard not to look surprised. 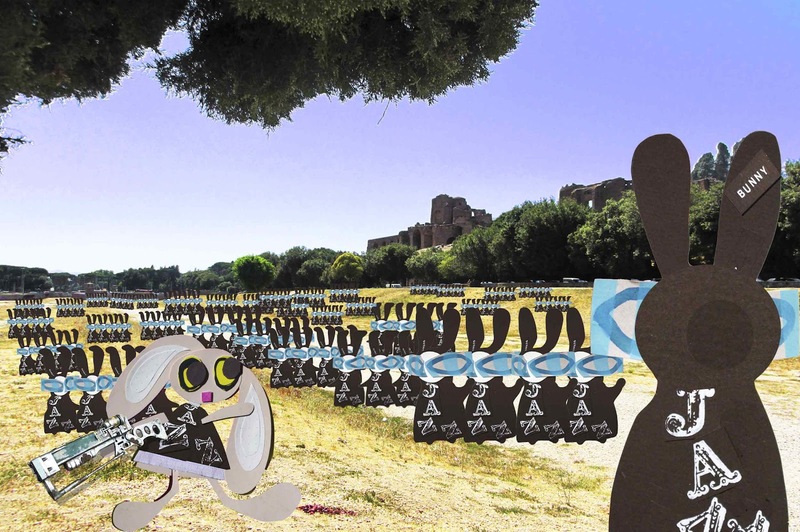 Stretching into the distance were the ranks of the Wabbit’s private guard, the 400 Rabbits. At the very front stood Lovely Lapinette and she held aloft a heavy snaser gun as if it was a child’s toy. The Wabbit was about to ask her what took her so long but decided to leave that for later in favour of oratory. He always pretended to dislike public speaking, but that never seemed to stop him when the opportunity presented. And so he looked at his army. "What is your name?" he yelled. "We are 400!" came the reply. "How many enemies do you see?" asked the Wabbit. "Not that many!" The roar was deafening. "What is the first position?" cried the Wabbit suddenly. "No effort!" roared the 400 Rabbits. "And what is the second?" shouted the Wabbit. "No error!" The sound of the 400 made a wind that bent the trees. The Wabbit raised a paw and turned to Lapinette. "You certainly took your time!" he hissed. "It made for a dramatic entrance," whispered Lapinette with a glint in her eyes. "The Wabbit knew that glint. "I like your new frock," he quipped. "You noticed!" sighed Lapinette. The Wabbit winked and turned back to the 400 Rabbits. He raised a paw and made a wavy sign and the 400 Rabbits rapidly assembled into a wedge. The Wabbit turned back to Lapinette and growled loudly. "On my Command!" There was a deathly hush in the ranks and everything was still. The Wabbit shrugged. "Unleash Hell!" he grinned.